Brian Fisher Print, Paint and Assemblage Blog: You say El Faiyum, I say Fayum. You say El Faiyum, I say Fayum. 'Saqqara, Oil on Panel, Gold Leaf, 48x36 in. In the Greco Roman Egyptian region known as Fayum or el Faiyum, the Egyptian cult of the dead inspired unique portraits that were bound to the mummified body. As such they became by definition objects of worship. Each was an intimate and symbolic part of the mummy with which it was found. The portraits were regarded not just as representations but as the immortal surrogates of the dead. Men were identified with the god Osiris and women with the god Isis. The mummies were considered to be essential for life after death according to Egyptian rituals and the portraits were sourced in style by the naturalistic traditions of Greece. 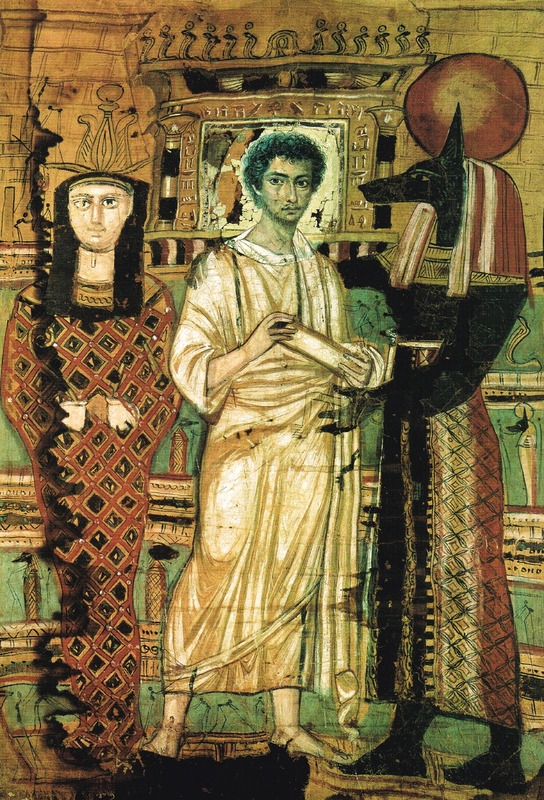 The Faiyum portraits are thought to have been painted from ‘sittings’ done during the youth of the subject and kept in the subject’s home until death, when the were placed on and bound into the mummy as the face or soul of of the deceased. The image (above) is my contemporary interpretation of a shroud, originally painted in tempera on linen and found at Saqqara, a settlement of the Faiyum region. 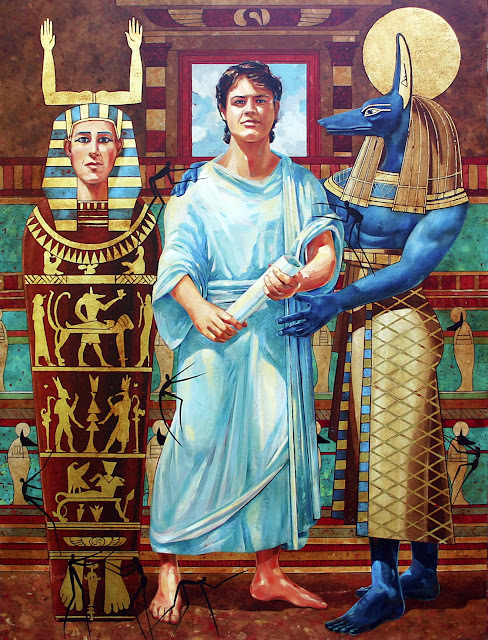 The original shroud depicts an almost life-size man in the prime of life who at death is being taken under the benevolent protection of the jackal god Anubis. To the left is Osiris, god of life eternal or the resurrecting deity, represented as a mummy. My painting and the inspiration for my interpretation (below) are alive with mysterious insect-like, stick or ant-like people. They may be depictions of the damned or represent souls that act as conductors to the beyond.